EDITION F has been the digital home for inspiring and successful women since 2014. 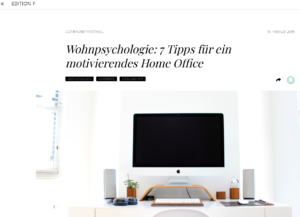 Inka Aniol gives 7 tips on how to optimally create your home office from the environmental psychology perspective. To keep motivation and productivity always present. When we enter a house or apartment, we quickly find out whether we feel comfortable here. It is not only the location, floor plan, furnishings and fittings that determine our first impression. Colours also have a lasting influence on us. 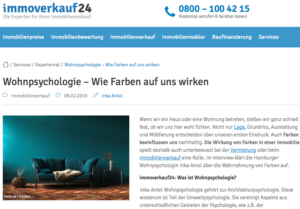 In the interview with immoverkauf24.de the Environmental Psychologist Inka Aniol gives us an insight into the world of colours. 04/2018 – SHE works! – Living and shaping life. Finally Monday! What Environmental Psychology can do for you in your working space environment. Many hours of our lives we are spending at our work. It is therefore worth taking a closer look at it. Which surrounding do we need to be motivated to go to work again? 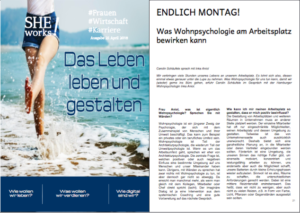 Carolin Schäufele asked Inka Aniol, Environmental Psychologist from Hamburg.